Binary Scam Alerts is posting an immediate SCAM notice in regards to the Drexel Code Software (AKA Drexel Code App and Autotrader) as well as Cory Drexel the fake CEO and second rate actor. After being drowned by a deluge of complaints and grievances from innocent day traders about a particularly deceptive and misleading new trading tool, we decided to dig in deep. Our staff of resourceful researchers has conducted a full-scale investigation of this appalling new system, and has come up with some extremely freighting conclusions about the latest binary options investment scam. As you can see the images below depict an all too well-known story about the same software being re-hashed over and over again. This should seal the lid on this stinking can of sardines, however just to make sure we proceeded to check out Mr. Cory Drexel and see if he has a public social profile. Needless to say, we were not very shocked to find out we are dealing with a ghost whose real identity we shall probably never find out. I do believe this person is a professional actor, however we were not able to collect evidence of this since they hired someone on the more expensive side to make it look more believable. They did however mess up on the testimonial, and you can see that one of the images in the fake accounts is taken from another older scam called “Sarah’s Confessions“. Drexel Code Review – 100% Winning Trades? Everything considered this puts this system on a different level, and I would refer to it as a Class A scam, which means it is extremely deceptive and is able to mislead everyday normative people in a very effective way with the exception of one thing. They REALLY destroyed it when they promised 100% wins, because there is no system in the world that can guarantee that, so shame on you cheaters!! I must admit the story about Beta Testers and how Katy Montoya, Clay Chancellor, and how the “Coffee Brew Team” are presented with the big fake checks as well as the the nifty branded sweater add a nice touch. The bottom line is that if you invest in this sham, you needn’t concern yourself with ITM ratios of 100 or even 60%, just grab whatever is left of your money and flee the crime scene. There will be no need for fancy charting tools, scalping techniques, technical analysis, or candlestick charts, all these will become redundant when you clash with your broker about how to “get the hell out of dodge”. You bet it is, and all you need to do is fund a trading account with a recommended broker with a minimum of $250 in order to qualify. These include but are not restricted to the Sydney System, TSI System Scam, My First Online Payday, Trade X Confidential, Limitless Profits, Millionaire’s Blueprint, Trade Tracker Pro, Binary Matrix Pro, The Free Money System with Walter Green, Binary App 810, TrianaSoft, the Amissio Formula, Tauribot, Citidel, Push Money App, Centument, Virtual Income, Insured Profits with Dave and Ginny. We see new systems coming out every day with promises of a new Babylon and instant wealth at the click of a mouse. In most cases these are nothing more than scams serving up the same dish on a different day. Binary Scam Alerts endorses the Binary Profit Method as it’s preferred Signals provider. If you are in the market for an Auto-trader please refer to our recommended automated trading section. 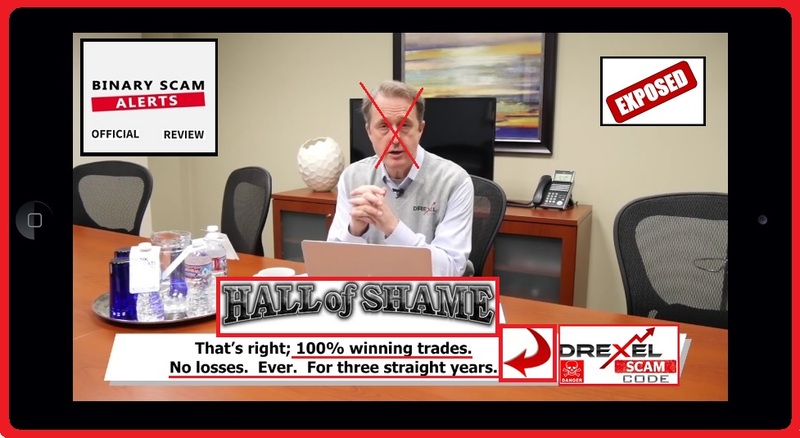 The Drexel Code Software (AKA Drexel Code App and Autotrader) and Cory Drexel the impersonator are an obvious scam and fraud. After conducting a proper review, we advise all our members and viewers to avoid this system like the plague and find better alternatives. We would like to personally invite you to join our Facebook group and Subscribe to our YouTube Channel.